This replacement chainsaw chain is a genuine Oregon chainsaw chain. 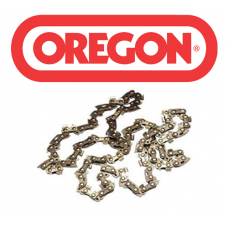 Oregon is well known for making high quality, reliable and durable products. This 10 inch replacement chainsaw chain has 38 drive links of type 91 chain. Type 91 ( 3/8" 91 1.3mm 0.50") chain offers outstanding performance in addition to low kick back and vibration. Fits; McCulloch M1, M2, M2B, M4, M4B, M6, M6B Oregon Type 91 chamfer chisel equivalent to Carlton N1C, Stihl Picco (Micro, Duro, Super), Stihl 63PM, Husqvarna H43X, EM S43X, Windsor 50R, Homelite 35-M50, GB (Sabre, TSC, Excel) 357, Dolmar 92.